“In the Still of the Night” by Carmen Cicero. PROVINCETOWN — Here is a town that can make you truly hate art. Brined in legend (fledgling artists’ colony! the Hans Hofmann School! Abstract Expressionists on vacation! ), Provincetown is to art what present-day Woodstock, N.Y., is to the ’60s: a travesty. Gallery after gallery selling slick, sententious guff; a cyclone of kitsch adorning both sides of the aptly named Commercial Street like so much tattered bunting. Still, there are some little jewels scattered among the dross — the Schoolhouse Gallery and ArtSTRAND, Albert Merola Gallery, a small handful of others. And then there is the Provincetown Artists Association and Museum. Founded in 1914, and renovated with the addition of a beautiful new wing by Machado and Silvetti Associates in 2005, PAAM is housed in a building that’s always pleasant to enter. As a museum, it’s uneven, and too focused on the past. But it gives off an aura of being deeply engaged with the local community without succumbing entirely to the mindlessness of “community-mindedness.” Someone’s in charge, in other words. Someone’s making value judgments. Summer is, inevitably, peak season at PAAM. In this early part of the season, two old hands at painting — Myrna Harrison and Carmen Cicero — have been honored with solo shows. And on July 20, a show of work made in Provincetown by the late abstract expressionist Robert Motherwell will open. Harrison was born in Hollywood in 1932. She started going to Provincetown in 1951. She studied with Jack Tworkov, Hans Hofmann, and Philip Guston. She and her husband, Earl Pierce, lived in a huge loft on the Bowery in Lower Manhattan, which became known as a great party venue; guests included Robert Frank, Allan Kaprow, Norman Mailer, Jack Kerouac, and Gregory Corso. In the mid-’60s, Earl and Myrna divorced. She moved to California, and thence to Arizona, where she still lives, although she continues to summer in Provincetown. The show includes early studies in charcoal and watercolor and some spiky, abstracted studies of plant life from the early ’50s when Harrison was at Hofmann’s summer school. She comes into her own, for my money, in the mid-’50s with a series of powerfully composed abstractions that achieve just what Hofmann was trying to teach: the creation of forceful spatial tensions through contrasting colors and painterly textures. The best have canting angles, zigzags, and striated parabolas that evoke the surging forces of nature. The landscapes that make up the rest of the show, in acrylics, gouaches, watercolors, and ink, are mostly from the ’90s and 2000s. 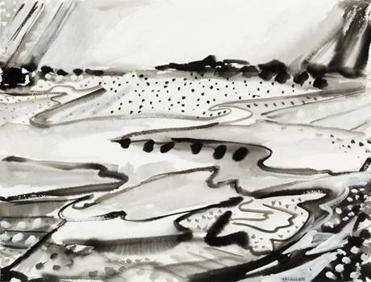 They relish patterned forms in nature, particularly the mountainous deserts of the West, and the expressive potential of rapidly brushed-on ink. But unlike Harrison, his later work seems to have nothing to do with the instinctive gestures of Abstract Expressionism. It is closer to the obsessive detail and dream-lucidity of Henri Rousseau and Rene Magritte. Both artists are alluded to in Cicero’s one-room show, organized by Bill Evaul, as are paintings by Tintoretto, Botticelli, and Courbet. Cicero’s distinctive vision includes trench-coated men striding along stone bridges under moonlit clouds; unpopulated cityscapes with miniature train stations and enigmatic billboards, and evening landscapes with windmills and crashing planes. Some of it falls into Surrealistic silliness — you half wait for a Monty Pythonesque punch line — but several of these paintings are really riveting, and brilliantly executed. 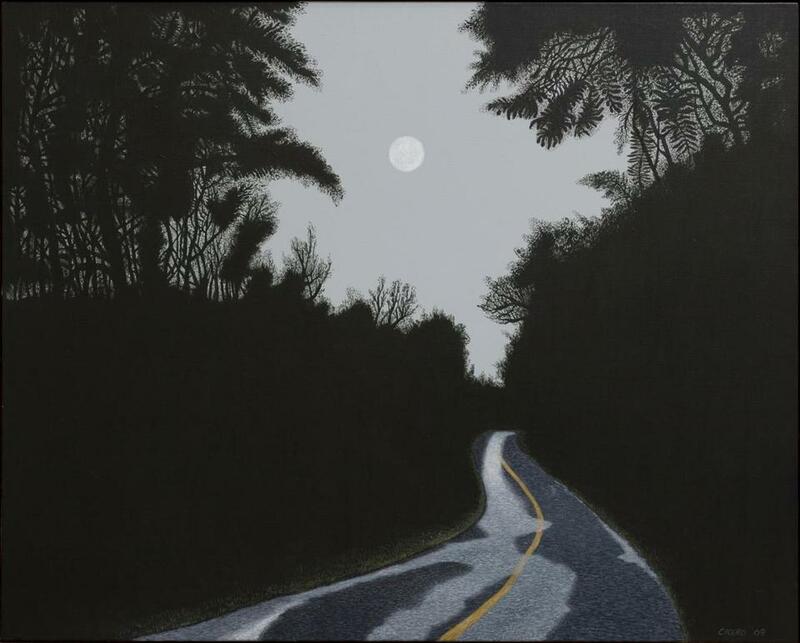 I especially liked “In the Still of the Night,” a study of a deserted road marked by pooling light and trees silhouetted by the light of a full moon. One thing Cicero has that is missing from 90 percent of the art showing in Provincetown’s galleries is conviction: You look at his paintings and instantly know that he believes in what he’s doing. As an artist, once you have that kind of conviction, anything is possible. As an observer, at the point you detect it, taste doesn’t come into it anymore: the belief itself — in the vision, the making — is volatile, and inherently exciting.